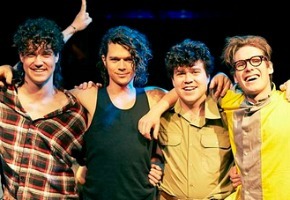 Seven’s anticipated miniseries INXS: Never Tear Us Apart will launch, as widely expected, on Seven’s first night of 2014 ratings. It will play at 8:30pm Sunday February 9 and 16. Downton Abbey is tipped to begin a week later. “The appeal of INXS, apart from loving the music and being a fan myself, is … when you drill down into it … it’s a really good underdog story. These guys started in a garage and really did take on the world.,” Head of Production Brad Lyons told News Corp. It stars Luke Arnold, Alex Williams, Hugh Sheridan, Ido Drent, Andrew Ryan, Nicholas Masters, Damon Herriman, Jane Harber and Samantha Jade. But it will be a double dose of Aussie drama with INXS going head to head with the return of Rake. TEN has Winter Olympics and Nine will reveal its hand later today. Well played channel 7 in announcing the Sunday night timeslot for INXS before 9 played their cards for the opening of ratings season night. I don’t think 9 would have had Schapelle to screen on a Monday night as their first choice timeslot but still both Mini-series/telemovies will rate very well. But thems the games between both networks. Even tonight on channel 9 The Block finished at 7:38 when the T20 international commenced at 7:40pm when it was also a design to stop/delay a % of viewers flicking over to MKR at 7:30. I will be watching Rake! I prefer to support an ongoing drama that I have what he’d for years! I am sure it will be a ratings smash! I am 20, and I will be watching. Being a huge Inxs fan & 80’s tragic i am really looking forward to this one but i wonder if anyone under 30 will be watching?. Not sure that airdates matter so much nowdays when many people have some method of time shifting available, i will probably pvr it & watch the Olympics, one of the only sports that interests me. Unlike the S*mm$r @l^mp!cs the W!nt$r @l^mp!cs are an unknown and are neither likely to be attractive enough that the other networks are best off giving Ten a free run, nor not attractive enough that you could run just anything up against them and play safe. It always seemed possible that INXS, Rake, The W!nt$r @l^mp!cs and Nine would have to respond with Schappelle (or Love Child or Underbelly). Nine’s other option is stick with The Block and TBBT and run stuff like The Mentalist and movies and try to launch stuff against established shows in March. This looks interesting. Im not a big INXS fan but I like some of there songs. I will watch it just to see how they formed together and there story. Doesn’t really interest me, but why oh why does everything have to be on Sundays when there are other nights of the week just screaming for something more competitive. I think I will record both episodes and then watch them together. From all the ads, it does look good.